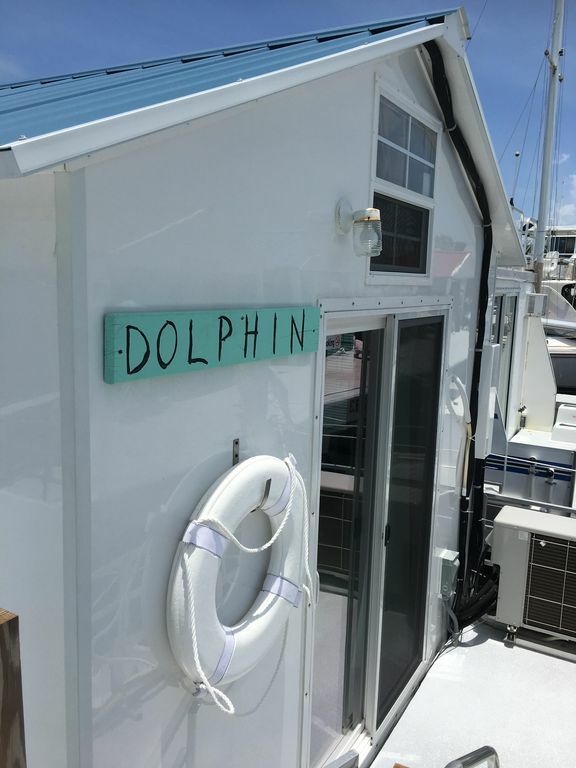 The Dolphin houseboat has 1 Queen bed, 1 Queen sofa sleeper and 2 Twin beds in the loft. Each houseboat has flat-screen TVs with cable and complimentary WiFi. The kitchen features a refrigerator, stove-top, microwave, coffee maker, toaster and well-equipped kitchens. The sliding glass doors lead to back patio with an upper deck overlooking wonderful water views, located between Key Largo and Islamorada in Tavernier at Mile Marker 91.7 on the Bayside, in a protected tranquil oasis cove of Community Harbor, in the beautiful Florida Keys. "Welcome Aboard" as we say here at Mangrove Marina! Situated on the waterfront, we are only 60 miles from Miami, 8 miles from Key Largo and John Pennekamp Coral Reef State Park, 10 miles from Islamorada, the “Fishing Capitol of the US” and the Theater of the Sea Marine Mammal Park and scenic drive south on Overseas Hwy, 90 miles to Key West visiting the southernmost point of the US and the famous Duval Street and all of the activities. Mangrove Marina Resort has full marina services including a heated pool, bath house with showers, toilets and laundry machines, a boat ramp, fuel dock, wet slips and trailer storage. Fin and Juice bar & lounge is on property serving festive drinks while looking out over the bay. There is complimentary WiFi in public areas and parking are also provided. Getting around: Public transportation is limited. Uber and cabs available. If you are looking to explore, renting a vehicle or boat is recommended. We are tucked away off Overseas Hwy Bayside, on twenty acres of hidden waterfront tranquility and beautiful sunsets in “Community Harbor” and the Intercoastal Waterway. Situated on the waterfront, we are only 60 miles from Miami, 8 miles from Key Largo and John Pennekamp Coral Reef State Park, 10 miles from Islamorada, the “Fishing Capitol of the US” and the Theater of the Sea Marine Mammal Park and scenic drive south on Overseas Hwy, 90 miles to Key West visiting the southernmost point of the US and the famous Duval Street and all of the activities.